October 10th-Kogawa Vs Hisataka headlines Dangan 112! The Dangan series of shows are some of the most varied and most exciting in Japanese boxing. Some of them are relatively weak, full of limited fighters looking for their chance to perform to win a small C class tournament competition. Other shows however are fantastic and it's one of those that we have this week as former world title challengers collide in one of the best non-title main events to have been on a Dangan show in a very long time. The bout in question will see Takuya Kogawa (22-4, 13), the man who by rights should by the WBA interim Flyweight champion, battling against perennial world title challenger Hiroyuki Hisataka (22-12-1, 10). Kogawa first appeared on the world stage when he lost a clear one to Thai great Pongsaklek Wonjongkam though he would rebuild and earlier this year he was unfairly denied the WBA interim title when he took it to Yodmongkol Vor Saengthep in a bout that looked like it had a clear, but not the guy who won the decision. As for Hisataka he has been in with a genuine who's who and lost in 4 world title fights, most recently to Omar Andres Narvaez. Whilst both men are on the fringes of world level it's actually an interesting bout due to the styles of the two men who are both busy fights and with that in mind this could be very exciting to watch. In the co-feature fans will get the chance to see Yuki Iwasaki (11-5, 6) battle against Wataru Miyasaka (8-2-1, 2). Although Iwasaki's record gives the impression he's not good he has mixed very good fighters such as Yusaku Kuga and Yukinori Oguni. As for Miyasaka he does have a better record but he isn't as tested as his foe. This could be good though we do think the battle hardened Iwasaki should be favoured. A third 8 round bout will see Mikiya Ishikawa (8-6, 1) battle against Masafumi Otake (14-12-3, 7) in what looks like a competitive support bout though not one that will get the attention of international fans, and in fact even Japanese domestic fans may not care too much about the contest. Prior to the 8 rounders we will have had 5 bouts in total, included in those 5 contests are 2 "C Class Tournament" finals with each of those fights featuring unbeaten men clashing in a 4 round contest. Unfortunately we don't yet have the names of those taking part in those bouts. From what we understand Thailand will play host to a WBC Asia Flyweight title fight. We're sadly unsure who will be involved though from what we understand the current champion is the unbeaten Nawaphon Por Chokchai (23-0, 16) who fought just a few weeks ago up at 120lbs. The only thing we know, for certain, about this show is it will be televised on Thai channel 7. March 4th-Just 1 day but 3 title fights! One of the great things about the Asian boxing scene is that no days seem to be off limits for big fighters. In the US and through much of Europe the big fights only take place on a Saturday night with some "B grade" world title fights being fought on a Friday. In Asia however it seems every day has the potential to be a boxing day. This is made obvious this week as we get three major title fights on a Tuesday! The first title fight of the day is also the most important bout of the day and takes place in Thailand. What makes this one the most important is that it's for the WBA "interim" Flyweight title. Sure it may not be the full version of the title but with the bouts we've had for it in recent years it's hard to deny that the fighters view it as just an interim belt. Last year we saw Koki Eto rip this very belt from the hands of Kompayak Porpramook in a thriller, then we saw Eto get beaten up and grind down as he lost it in his first defense. The man who beat Eto for the title is Thailand's unheralded Yodmongkol Vor Saengthep (33-2, 20) who may not be a big name but is a big talent. He'll be hoping to prove that once again as he attempts to defend his belt for the first time and battles former Japanese national champion Takuya Kogawa (22-3, 13) in what is potentially another war for the belt. Kogawa is skilled and experienced though he is 0-1 in fights in Thailand and in world title fights and Japanese fighters have had notoriously bad luck in world title fights in Thailand. We honestly think Kogawa winning would be an upset though we can't see him going down with out putting up a real fight in what promises to be a memorable affair. In regards to rest of the card, we really don't know what to expect. We're expecting it to be televised on Thai TV though just what will be televised is a whole different question. Whilst we get the interim world title fight in Thailand we also get a Japanese title double header in Japan, under the guise of Dangan 95". The first of the title fights will see the unbeaten stoppage machine Hiroki Okada (7-0, 7) attempt to claim his first title, the vacant Japanese Light Welterweight title. In Okada's way is the tough, though limited Masayoshi Kotake (9-7-1, 5). Kotake, who is a tricky southpaw, is expected to cause Okada some problems, though we still expect Okada's power and strength to over-come Kotake. 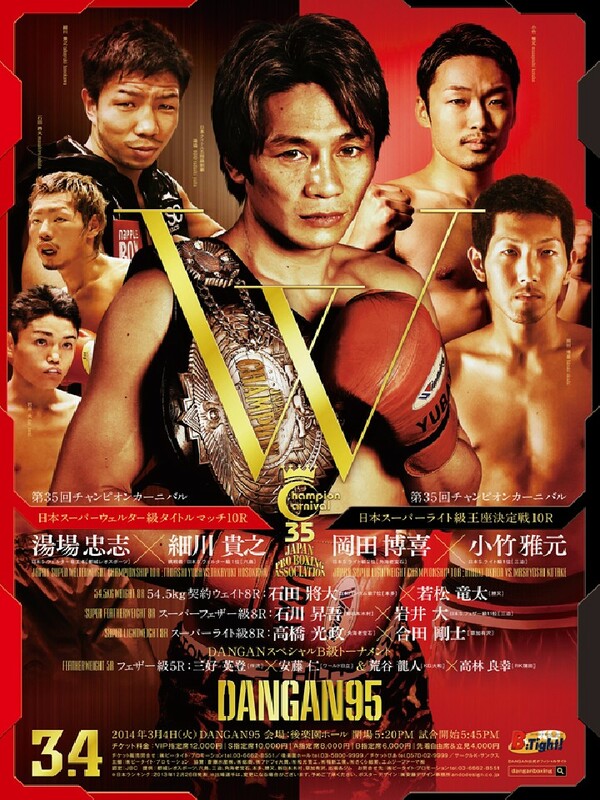 Following the Japanese Light Welterweight title bout we get the second Japanese title bout as the legendary Tadashi Yuba (45-8-2, 32) attempts to make the second defense of his Japanese Light Middleweight title. Unfortunately for Yuba things aren't that easy and he'll have take on Takayuki Hosokawa (24-10-3, 8) who has already run Yuba incredibly close in a fight a few years back. Although Hosokawa doesn't have the greatest of records he is a decent fighter and is much younger than the champion and has already given him fits. Although it's Yuba's bout to lose there is plenty of risk in the contest. As well as the two title fights we're expecting 4 other contests, the most notable of which will feature Dai Iwai (13-3-1, 5) fighting in a testing contest with Shogo Ishikawa (10-5, 3). This may not b a great contest on paper but it's a well.